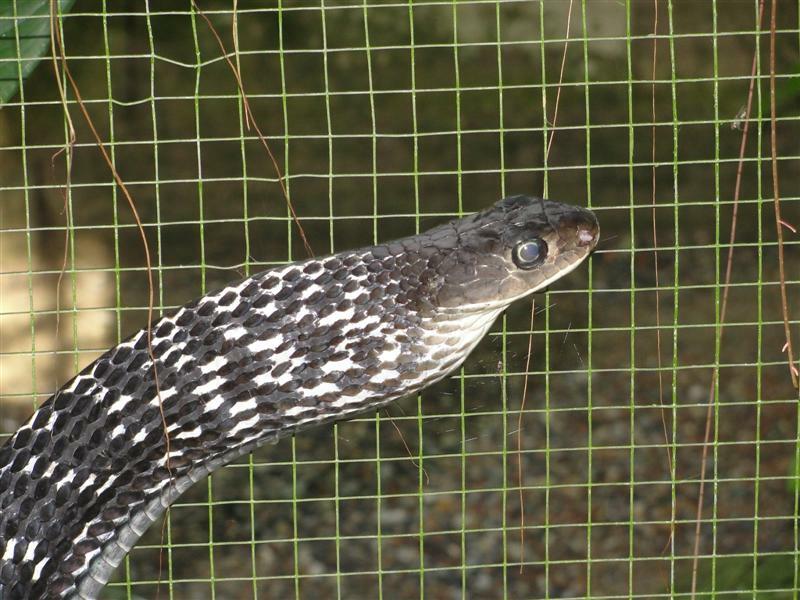 All the snakes kept long-term at the Krabi King Cobra Show have bad nose-rub from trying to escape their wire cages. 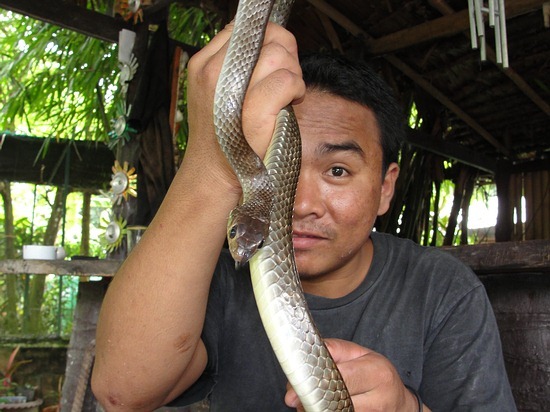 Snakes caught and given to the Krabi King Cobra show are fed to the King Cobras – which each eat a snake each week. Snake tail? Hard to believe, right? This is a Blood Python’s tail. The Krabi Snake Show often has one or two of these pythons for viewing in one of the cages. 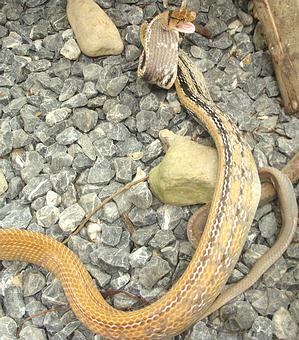 Keeled Rat Snake – Ptyas carinatus – Not Dangerous (not deadly). These are not found often, but occasionally the Krabi snake show has one to show. 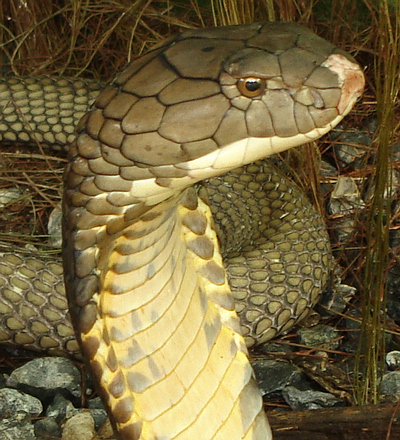 These snakes can reach 3+ meters in length and substantial girth. 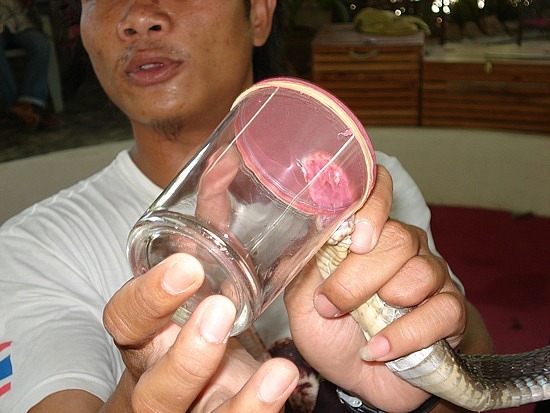 The fangs and venom glands ARE in all snakes at the show… No fangs are removed, no venom-sacs are removed at the Krabi King Cobra Show. Here, a monocled cobra is milked for venom so tourists can take photos. Wild Caught Captive King Cobra. In March and April, the show may have 30-50 king cobras they have caught just in the Krabi area around Ao Nang and Krabi town. Jackie, a Burmese guy, worked at the show for a few years. Here he is holding a Burmese Python – which are not used in the snake shows. 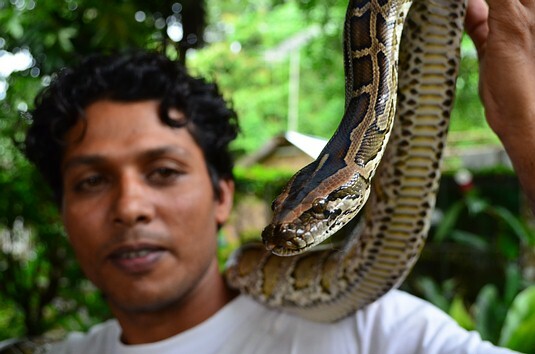 Monkey Man holds an Indo-Chinese Rat Snake at the Krabi King Cobra Show. This snake was later fed to one of the king cobras at the show. 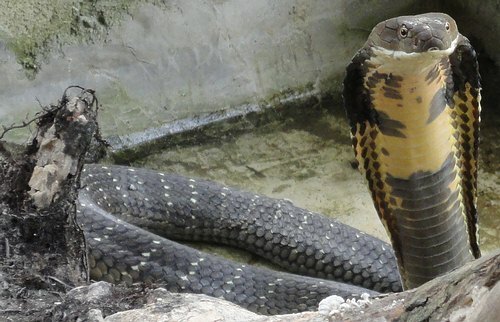 The king cobra show is located just up the road from Noppharat Thara Beach in Ao Nang Beach, Krabi, Thailand. The open hours are 9 am. to 5 pm. typically, but you can have an after hours special show if you make a reservation with one of the husband-wife owners. 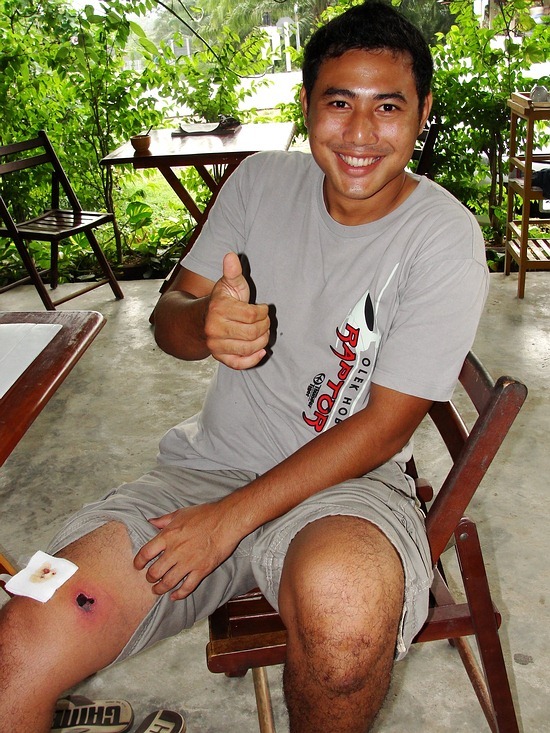 Cost of the Krabi King Cobra Show depends if you want to see the Monkey Show as well. You can always ask for a lower price if it seems too much. I am not sure if you will get it at the price you want, or not.